You may be surprised to learn how deadly some household items and garbage can be for wildlife. Taking some quick precautions when you store items in your yard or dispose of household waste can save lives. can be deadly to untold numbers of small animals, birds and fish. Please ensure any you have or find are cut into small pieces (all of the rings must be cut) before being discarded or recycled . If thrown, uncut, into the garbage these rings can still kill, as many birds look for food in garbage dumps. should be coated, as they can – in very cold weather – cause a bird’s feet to stick to the wire or container and severe tearing can result. When removing this from cooked roasts, chicken, turkey, etc. wash it and cut into small pieces. Long pieces of twine when eaten by an animal may cause intestinal problems resulting in death. Some birds may also use this as nesting material and the parent birds or nestlings may become entangled in it. Discarded kite or fishing line can result in birds and sea mammals becoming entangled and often results in death. 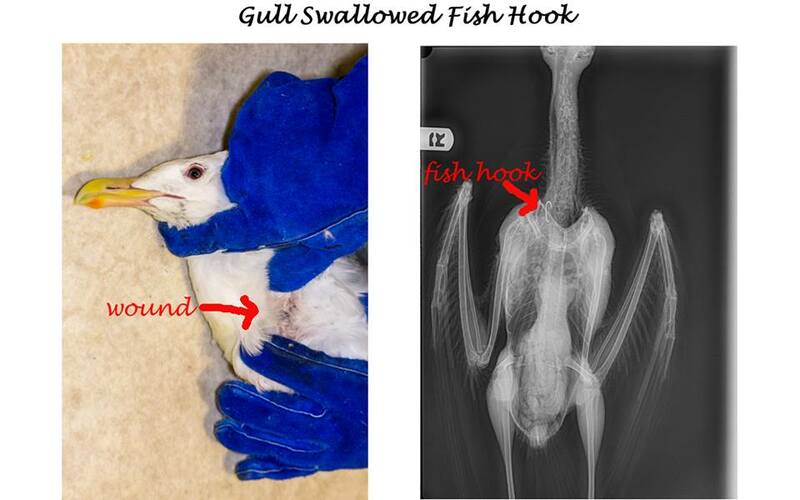 We, at Gibsons Wildlife Rehabilitation Centre have received into care gulls and ducks with fishing hooks and lines entangled around their wings and mouth. Many have died from the resulting injuries. Should not be used to store melted fat. Animals find this food clinging to the broken glass at garbage dumps. Consequently, glass is swallowed and mouths are cut and the animals or birds are left to suffer and eventually die. and other containers left outside to become filled with rain water can mean death to small animals and birds. Turn all tall receptacles over to be on the safe side. If you collect rain water for indoor plants or to use yourself, please secure tops of buckets with nylon mesh. As soon as your crop is over, please remove this. Birds can become tangled in the netting and be injured trying to escape or die trapped in the netting.